Pickling is to corrode away the metal oxide from surface layer of the parts. The fluids consist normally of various types of acids which depending on the material that is to be pickled. Some common pickling acids are; sulfric acid, hydrocloric acid and phosphoric acid. Separators for these applications are manufactured in mild steel and lined with acid resistant material such as polypropylen (PP) plastic material or rubber. The lamella plates are usually made in pp-plastic. Separators are usually manufactured in accordance with customers specifications. As the ion content of metal raise formation of salt cristals in the acid bath. The purpose of the separator is to remove the cristalised salts out of the bath. As the acid bath becomes saturated with metal ions, cristal salts persipitate and settles to the bottom of the fluid tank. 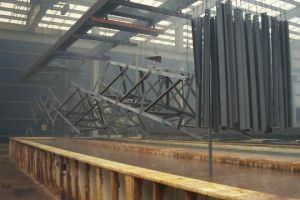 These particles and other contaminants will settle on the lamella plates as chrystals and sink down to the bottom of the separator and then be removed by discharging through the bottom valve.